The best way to make square, straight crosscuts on lumber or plywood with a circular saw is by using a homemade crosscut guide. Cut a piece of 1”x 4” lumber the length you want to crosscut plus about 6” (we made our guide 18” long for crosscuts on boards up to 12” wide). Cut a piece of 1/2″ plywood 3” wide by 16” long. Glue and screw the plywood to one end of the board at a 90° angle, using a framing square to align the two pieces. Place the crosscut guide on a scrap board, and run the saw along the guide so it trims off the excess plywood cleat on one side of the guide. Mark the board you want to cut at the location of the crosscut. Align the end of the crosscut guide cleat with the mark. Hold the crosscut guide firmly in place, and run the base of the circular saw along the crosscut guide to make the cut. 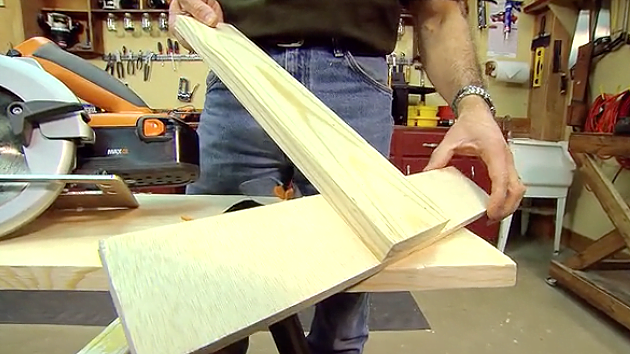 Joe Truini: One of the quickest and easiest ways to make crosscuts is with a portable circular saw. The challenge, however, is how do you make cuts perfectly square each and every time. Well here’s one way, with a crosscut guide. This is simply a one-by-four about 18” long and a cleat that’s three by 16” long, that’s a piece of half-inch plywood. I just glued it and screwed them together using a square to make sure these two surfaces are perpendicular. Now, before using the guide, you need to trim off the cleat and here’s how. Just take the saw and make a cut right along the fence trimming off that end of the cleat. Now, I’ll show you why I did that. Let’s say you want to make a cut right here. All right, that’s that cross. That’s where we want to crosscut this one-by-twelve. So now you just have to line up. We know that the edge of the blade is right here, so I’m just going to line up the cleat – the end of the cleat – with that mark, and make the cut. There you go, nice clean cut right on the mark. Great tips before I start my big spring fence project! I have struggled with making cross cuts with circular saw. This is a great solution.